I used to be brainwashed by one of the biggest electric toothbrush manufacturers and thought that there is no better toothbrush than these round-headed ones. I was so stuck in this illusion that I didn’t even give another toothbrush a chance to be better. But then I moved to another country where two of the biggest toothbrush brands were almost equally popular compared to my country of origin where this manufacturer with round-headed toothbrush was and is dominating the markets. In my new country of residence I was offered a free trial of the Philips Sonicare. I was amused by the looks of it (it was the old model) and thought it wouldn’t be a very good toothbrush. I almost declined the free trial because I was so convinced about the superiority of this round-headed toothbrush. But then I gave it a go. It was ticklish as hell at first but thankfully my colleague dentist had warned me about it. I carried on using it for the full two minutes. Once I was done I got my moment of awakening. My teeth had never felt better. So smooth, so clean. I was treating a lady – lets call her Sue – at her early twenties for severe gum disease. She had already had periodontist treatment and understood the severity of the situation considering her young age. Sue was very motivated to look after her teeth and did everything she was advised to do. Sue had a surface retained glass fibre reinforced periodontal splints (everStick®PERIO) on her lower and upper teeth. She was using Tepe interdental brushes of various sizes twice a day and an electric toothbrush – the round head one. She changed the brush heads every month (even though she was informed it was necessary every 3 months). Her brushing technique was checked many times and it was perfect. But every time I saw Sue for the 4-monthly scale and polish she had supragingival (visible) calculus on her lower front teeth. Lots of it. And she started to be very distressed about it because she was doing all the right things to prevent it. I tried to ease her worry and told that the supragingival calculus was not a problem gum wise as long as it was removed regularly. And in her case the gum didn’t even get inflamed by the presence of supragingival calculus. But it did not calm her mind. She didn’t like the looks of it as it was clearly visible for anyone when she smiled. I had no idea what to advice more than I already had. She had all the right tools – interdental brushes and a latest model of an electric toothbrush. She used them often enough and with a correct technique. Then I thought about Philips Sonicare I was using. I suggested to Sue that she could change her toothbrush. I expressed my frustration over the fact that she had spent quite a lot of money for the current toothbrush but this was all I could think of that might help her. I showed her the correct technique of the Sonicare just in case she followed my advice. Next time Sue came in she had a wide smile on her face when she entered my surgery. She said the calculus had not built up at all! Sue had gone straight to the shop after the last visit and bought the Philips Sonicare toothbrush. She was very happy and thankful for the advice I had given. This was even more of an eye opener for me than my own first experience with Philips Sonicare. The name says it all. It’s because of the sonic vibration. When used correctly the sonic vibration can reach beyond the bristles as the sonic vibration travels through the liquids in mouth. People who think Sonicare is not a good toothbrush have not used it with a correct technique. 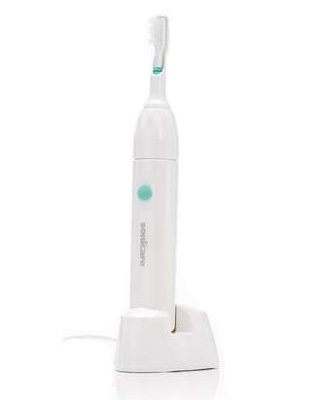 I have notice in the past 15 years of using the Sonicare that I and my patients who us it, get less stains. Hardly any even though I drink coffee and tea. In my country where I live and work now the Philips Sonicare toothbrush is not very widely used or recommended by the dental professionals. I am considered as odd one out when I tell I use one. And even stranger it seems that I recommend it to some of my patients. Almost as if I didn’t know my business. In the dental show case I didn’t even find a representative of Philips Sonicare from any stands. And I cannot find any contact details for a rep to invite her to my practice or to express my views over their marketing strategy. You see the marketing is very poor compared to their competitor who has given trial models to my practise with disposable brush heads so that the patient can be shown the correct technique etc. They give out free electric toothbrushes to the professionals (I have written about it on my previous post) and visit practices regularly to promote their products. But thankfully the Philips Sonicare toothbrush is available in the shops. And I am doing a small-scale marketing for them. My hope is that they would take more aggressive approach to the almost non-existing marketing. I could even go to the next show case as their representative just to annoy the rep of their competitor who told me that the Philips Sonicare is as effective as manual toothbrush (you can read about it here). It would definitely make my work easier when convincing the patients about the superiority of the Philips Sonicare toothbrush. And perhaps my colleagues will start to recommend it too.